Does the time of year when you put your home on the market affect how well it will sell? What about the final sales price? According to many studies in housing trends, the answer is yes. The time of year when you sell your home can have an effect on how many people are interested and how much the home will sell for. Of course, if you need to move and sell your home at any point of the year, you will still be able to find buyers and negotiate a price that works for you. In some areas of the country, the currently swift moving housing market can help overcome poor timing. However, if you have the ability to plan for a more advantageous time, it makes sense to make the most of your flexibility. One of the best times of the year to sell your house is in the late spring and early summer — like right now. The school year is over for most families, and many people will be looking to purchase a home that they can move into over the summer and get settled before school begins again in the fall. Housing sales peak during this time, as studies show that 60% of people tend to move during the summer. If you can sell your home during the spring or early summer period, it will typically be on the market for a shorter amount of time and you may have many more offers to choose from. One of the worst months of the year to sell a home is December. There are a number of reasons why trying to sell a home during the Christmas holidays can be difficult. Most people aren’t thinking of moving this time of year. Their energies are focused on decorating their houses, preparing for the holidays, visiting friends and family and enjoying their time off work. Another difficult time is the beginning of the school year, typically in September. Children will have just started school and most families will not be considering moving at this point. If you attempt to sell your home during this time of year, you will be much less likely to get the the same pool of buyers that you might see in a more “move friendly” time of year. Of course, these are just guidelines to help you plan your next home sale. No matter what time of year it is, if you need advice on selling your home, call your trusted real estate professional right away. 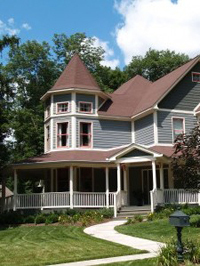 Winter may have taken a toll on your home’s exterior this year. You’ve been noticing the cracking paint for months, but you don’t want to shell out the big bucks to hire a professional painter. Don’t fret! With the weather warming and the nice summer weekends, it’s the perfect time to tackle that project of painting your home. While this might seem like an insurmountable task, especially if you have a multi-story home, it’s not. It just takes the right tools and a bit of hard work. Below are step-by-step instructions to having the outside of your house looking shiny and new. Homes built before 1978 could have used lead paint, so be careful if you have an older home. They make kits that test for lead paint. If your home tests positive, then ensure you take the necessary precautions to keep yourself and your neighbors safe. You need to wash the exterior of your home before painting. Mildew thrives under new paint, so kill it with a solution of water and phosphate-free cleaner. Take a scraper to your home’s exterior to remove any peeling paint. Spraying water under the paint as you scrape helps speed up the process. Then sand down any rough spots, so that you have a smooth canvas. Paint on the primer immediately after you’ve prepped the wood. This will provide and even base for your topcoat of paint. You’ll need to caulk all the joints to prevent water penetration and air leakage. Plus, caulk does a great job of filling in blemishes in your siding. Choose a water-based latex paint. It’s easier than applying oil-based paints. However, if your home already has an oil-based paint, you’ll have to stay with it. Once you’ve selected your favorite paint color, just grab a brush or rent a sprayer to start painting your home. Be sure to check your home annually for any potential problems. Replace cracked caulk, remove mildew and patch any peeling paint before it spreads. Utilize the beautiful summer weekends to get started on painting your home. Understand that this process normally takes two weekends, so be patient. Plus, by not hiring a professional, you’ll save a significant sum of money and have bragging rights when you receive compliments on the condition of your home. For more information about the optimal plan for the mortgage on your home, feel free to contact me by phone or email. Moving to a new city is always exciting but offers challenges like this one for families. For more advice on moving to a new home, contact your trusted mortgage professional today. Imagine that you’ve found the perfect home and are ready to apply for financing. Your home loan approval amount comes back lower than you would have expected and at an interest rate significantly above what you have heard is available on the market. This could be because you have an average to poor credit score. Mortgage lenders base interest rates on many things, but your credit score plays a large part. Anything between 720 and 850 will typically qualify for better interest rates. A mediocre score is usually between 660 and 719, and a low score is 659 and under. If you have a lower score than you’d like, below are a few traits for you to follow of people who possess higher credit scores and secure the best home financing. They don’t max out their cards. It’s better to keep a low revolving balance on a few cards than to spend every dime allotted on one. The ratio of credit card balance to your credit limit is called credit utilization. The higher your credit utilization, the larger affect it can have one your credit score. They make payments on time. This is very likely the most important tip for your credit health. If you miss a payment on a term loan, credit card account or monthly home bill, then you could be turned over to collections, which will affect your score negatively. You will almost surely be reported as late to the credit bureaus, which will in turn drop your credit score precipitously. Absolutely make all of your payments before their due date. They stay with one card. Don’t close and open credit card accounts frequently. Each time you make a change to your line of credit, it affects your score. Even if you don’t want to be tempted to use a credit card, keep the account open and leave the card at home. According to the Fair Isaac Corporation (FICO), high credit achievers have accounts that are usually at least 11 years old. Excellent credit could qualify you for a better interest rate, which might save you thousands of dollars over the life of the loan. So stay on top of your monthly credit bills and keep a low balance on just a few cards to watch your score steadily increase. If you’re ready to learn more about your ability to purchase a home, call your trusted home financing professional today. If you enjoy both history and fixing things, then you may have trouble driving by historic homes for sale without feeling the urge to buy and fix one up. Before you do, however, you should know the three R’s of fixing historic homes — Restoration, Renovation, and Repair. “Restoration” is the process of returning a home to its original state. Restoring historic homes often requires city and state permission. It’s essential that you check to see whether your home is listed in the National Register of Historic Places (NRHP); or, whether it’s located in a historic district. If either is true, there may be a specific set of rules to follow while renovating. Restoration can be an expensive endeavor. For a home to keep its historic value, the materials used must match the home’s original materials, including furnishings. This can be costly because of antique value. Renovating is less complicated and less restrictive as compared to restoring. However, via a renovation, a home often becomes a more “modern” living space, which can lower the home’s historic value. Be sure that your home is not listed in the NRHP or located in an historic district before beginning renovations. Depending on size of the project(s), renovations can be expensive, too. However, it’s easier to find great deals on modern appliances as compared to the antique appliances required for a restoration. Repairs are often less intensive than a restoration or renovation. For repair, be sure to use materials which fit the home’s character, which may include plaster walls and wooden floors, for example. Matching original materials is not important in the home repair process.. The cost of a repair project will depend on the size and volume of required repairs. The differences between a restoration, renovation and repair of an historic home may be minor, but those small differences will change your costs, your timeline and your procedural red tape. Speak with an qualified architect if you’re unsure of your obligations as the owner of a historic home.